Buldak is a spicy chicken dish that is becoming very popular amongst the younger generation of Koreans everywhere. Its popularity has been attributed to both its unique flavors and spiciness. 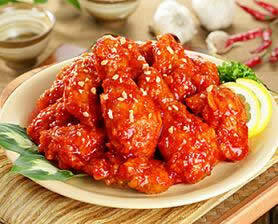 Keep in mind, the term bul means fire in Korean and dak is chicken, so it can get quite spicy in taste. Many restaurants that specialize in buldak have been created due to the growing popularity as this dish is considered fairly new. Also, most restaurants that serve this dish offer various levels of spiciness that one can choose from and there are usually fresh vegetables served with this dish to blend in the taste. Cubed-cut sweet radishes along with salad and onions are usually popular. An order of buldak can be served on a platter of bite-sized morsels of chicken breasts or sometimes in combinations of wings or drumsticks. While the flavor and degree of hotness differs a little from place to place, it is marinated with a hot & sweet sauce, grilled over an open fire, and then served over a sizzling skillet, topped with cheese as well as various herbs. It’s usually enjoyed as an appetizer while drinking a cold mekju or soju at popular bars or restaurants. In a large bowl, mix chicken with soy sauce, sugar, mul yut (substitution honey), cheong ju and ground pepper. Marinate in refrigerator for 30 minutes. Puree all marinating sauce ingredients together in a blender. Once completed, leave aside for later use. On a non-stick frying pan or skillet, cook prepared chicken over medium heat until meat is just short of desired completion. Take out chicken only and leave excess ingredients in frying pan or skillet. In a large bowl, thoroughly mix chicken with blended sauce from steps 2 & 3. In the same frying pan or skillet, add olive oil to taste and cook for an additional 3-4 minutes in medium high heat.